If you've been anywhere near Pintarest lately or perused a craft magazine you'd know the world is positively festooned with colorful bunting, long streamers and cute decorative pennants and flags. Inexpensive to make and high on the "wow" factor, paper garlands are popping up everywhere, and like so many other great projects, I knew I needed to put a Beer Crafts spin on them. 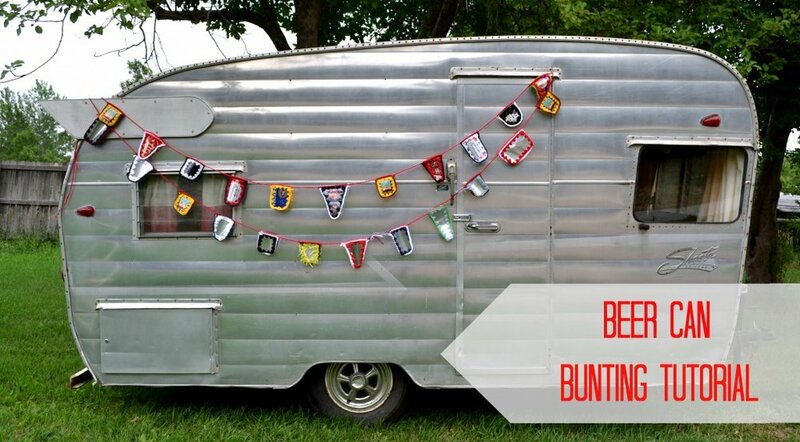 My bunting is designed a super simple crochet pattern, the same that fab fiber artist Bekki Scotto used for making the hats in the Beer Crafts book, and in terms of party decor it's as cheap as it comes- empty beer cans and yarn from my stash. The only supplies you'll need are pair of scissors, hole punch and a crochet needle. A six pack (or two) later and your back porch is gonna look styilin- Best part about this craft, aside from the tasty beers you'll try on your way to making it... is it's portability, the banners pack small and if you're using a forgiving yarn, you can leave them out overnight. I've had a blast this summer traveling to some outstanding bookstores and breweries and my bunting has decorated all the festivities getting just a little bit longer with each stop. This Saturday, August 24th I'll land in Cincinnati for even more crafty fun at the Christian Moerline Tap Room, and Cincinnati Arts Center and Arnold's Bar on the 26th, you'll know me when you see me, I'll be the girl with a beer in one hand and bunting in the other- and say, beer can bunting looks perfect for yarn bombing... maybe some of my extra fun Cincy pals will want to join in that fun too! Looking forward to crafting it up with some fine local beers- I know there will be some MadTree Brewing cans getting added to the chain for sure. Below are my directions for making bunting and if you're ANYWHERE near Humbolt county this Wed. you absolutely must go meet Bekki and the kids at SCRAP- they'll be having a fab evening of making, and of course THERE WILL BE BEER. 1. Crack open your favorite can of beer and empty it (my favorite method for this is pouring it into my mouth). Rinse can with water and let dry. 3. Using a can opener on the OUTSIDE of your lid remove the top to your can. 6. With your hole punch make holes around your can about 1/4 inch from the edge, make sure you have holes in each corner and spread the rest in between about an inch apart. 7. Using your crochet hook sl st into your top right corner hole of can panel and ch3 (counts as 1 dc), dc 2 into the same hole, dc into the next hole and all following holes until you get to the next corner, dc 5 into the left corner and repeat your work around the can, working 3 dc into holes along straight edge and 5 dc into corners until you arrive back at the start. Work 2 more dc into the starting corner, sl st into the second ch of the ch 3 and tie off. 9. To connect the flags you'll be making a big long crochet chain- you can work these in a larger needle if you'd like and even even work on a bulkier yarn. I wanted to make sure I had a nice long tail to tie each end off with so I chain stitched about 18 inches then worked my chain across the top stitches of the flags spacing the flags about 18 inches apart. I knew I wanted to make my flags cover some big distance so they are fairly well spaced, they'd look pretty darn cute if you spaced them closer together too. 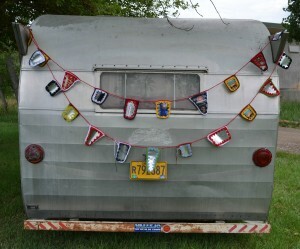 I'd love to see how your bunting comes out, send pics and I'll post them on the blog.